Who was William Don Maus? 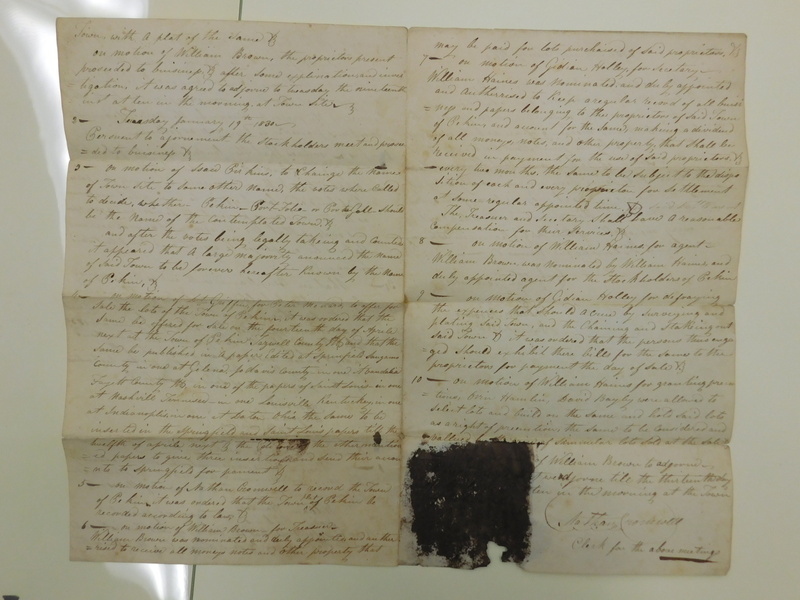 Last month we examined some fascinating details of Pekin’s founding that were recorded in a four-page document from 1829-1830 that had been included in the 1914 Tazewell County Courthouse time capsule. 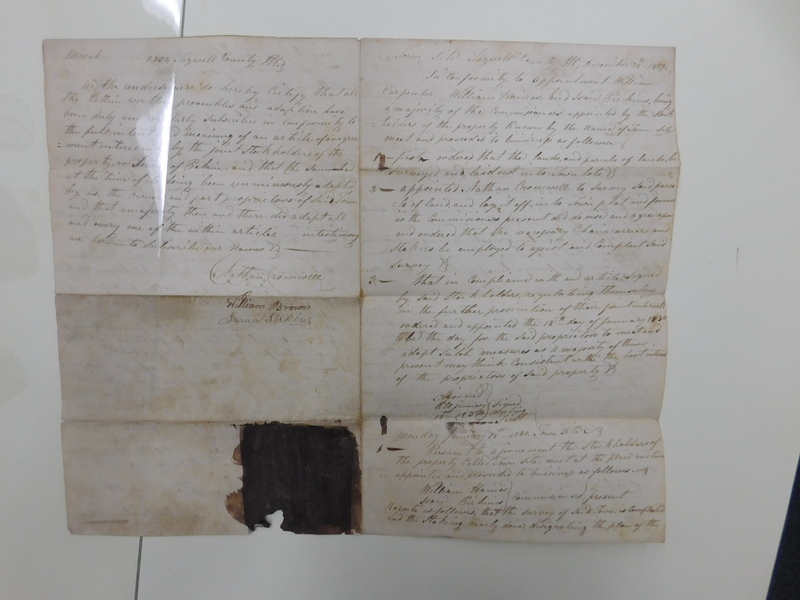 We probably will never know exactly how this document ended up in the possession of William Don Maus, but thanks to the standard published works on Tazewell County history, we do know who Maus was – and who he wasn’t. He wasn’t Dr. William S. Maus (1817-1872), son of Samuel and Elizabeth Maus of Northumberland County, Pa. Dr. Maus was a pioneer physician of Pekin who came to Pekin prior to 1832. He assisted the victims of Pekin’s cholera epidemic in July 1834, and later served on the committee that oversaw the construction of the old Tazewell County Courthouse in 1849-50. This column featured the biography of Dr. Maus in the Sept. 14, 2013 edition of the Pekin Daily Times. “William Don Maus (deceased), lawyer and former County Judge of Tazewell County, Ill., was born in the city of Philadelphia, Pa., September 22, 1836, the son of Dr. Samuel Gustavus Maus, who came to Southern Illinois in 1838, and was widely known in that section of the State. Through his paternal ancestors he was of Rhenish-Bavarian stock, early member of his family having originally emigrated from Zweibrucken, Bavaria, Germany, to America. His mother (born Goodman) was a lineal descendant of one of the families that founded Plymouth Colony, coming to America in the Mayflower. His father, Dr. Samuel Gustavus Maus, on coming to this State with his family in 1838, settled at Murphysboro, in Jackson County, where for a number of years he was the partner of Dr. John Logan, the father of Gen. John A. Logan. “During these years the young sons of the partners formed a lasting friendship and attachment, which was severed only by the death of Senator Logan. About 1847 Doctor Maus moved to Tazewell County and settled at Tremont, and the son from that time to the date of his death, a period of fifty-four years, was a citizen of Tazewell County. His education as a youth was the best the new state afforded; but the opportunities for mental training of young men in that early day were very limited and crude compared with what they are to-day; the successful advent of the common- school system was but a prophecy then, and most of the educational advantages were by private tutors and in private schools. He finished his literary education in the schools of James K. Kellogg in Tremont and the English classical high school at Pekin under the direction of Rev. G. S. Bailey, D. D., in the old brick mansion house on the Tharp place, which were educational institutions of considerable note in that day. “In 1854 Mr. Maus removed to the city of Pekin to reside permanently. He read law with Judge Samuel W. Fuller, who afterwards became a prominent member of the Chicago bar. In January, 1857, he was admitted to the State bar and continued the practice of his profession in the State and Federal courts for a period of forty-four years, all of which time he was an honored, respected and eminent member of the bar. “The official positions held by Judge Maus during his residence in Tazewell County included those of Deputy Sheriff for a short time in 1858: Master in Chancery from 1858 to 1867: and County Judge from 1863 to 1865. He was prominent in the councils of the Democratic party, of which he was an active member and which he represented as a delegate from his district in the Democratic National Conventions of 1876 and 1888. In his later years he devoted his attention exclusively to the practice of his profession, declining in 1885 to permit the use of his name as a candidate for Circuit Judge. “September 11, 1856, Judge Maus was united in marriage, in the city of Pekin, to Mary Clauser, who was born in Pennsylvania and came with her parents to Pekin, Ill., in 1839. Of this marriage there were three children who still survive: Mrs. Adrienne (Maus) McDonald, of Pekin; Kate, the wife of George F. Nasler, of New Orleans, La., and Fred P. who is an attorney of Pekin. Mrs. Mary (Clauser) Maus, the widow of Judge Maus, also resides in Pekin. It was after Judge Maus’ death in 1901 that the above-mentioned document from Pekin’s founding was located among his papers in his office, coming into the possession of Pekin attorney John T. Elliff (whose son Nathan T. Elliff followed in his father’s footsteps, becoming a lawyer and serving as Tazewell County State’s Attorney in the 1930s). Then in November 1914, the document became a last-minute inclusion in the new courthouse’s time capsule.